Oct. 31, 2007 On October 18th, the first All-hands Meeting for the NSF RII award took place in Baton Rouge. As members of the RII Advisory Board, Ron Hutchins, Jordan Konisky, and Vince McCoy were present. Two of the LONI Institute fellows attended the meeting as well. You can download presentations of Drs. Allen, Cortez, Gaver, Khonsari, and Seidel. Here are pictures and a few more details on the meeting. Sept. 28, 2007 NSF RII Project Funded: The NSF EPSCoR project, of which CyberTools is a key component, is funded by NSF. The project, which officially starts Oct 1st 2007, will run for three years with a budget of $9M from NSF and $3M from the Louisiana Board of Regents. Sept. 24, 2007 The CyberTools website is officially launched! The website is hosted by LONI at http://cybertools.loni.org. The initial design was created by Ana Buleu, and the initial content by Ana Buleu and Gabrielle Allen. 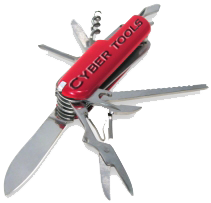 The CyberTools logo was designed by Ana Buleu, Gabrielle Allen and David Gallop. Summer 2007 The first CyberTools planning meeting for Work Package 4 was held at CCT in Baton Rouge. October, 2006 What is CyberTools? CyberTools forms a core part of the Louisiana proposal to the NSF EPSCOR research infrastructure solicitation. If awarded, the proposal titled "Louisiana's Research Infrastructure Improvement Strategy" will fund a variety of scientific research and educational programs along with CyberTools research and development over a three year period. July, 2006 Motivation: CyberTools is created in response to a solicitation from the Louisiana Board of Regents for proposals for the NSF EPSCOR RII solicitation, motivated by the need for application enabling cyberinfrastructure to leverage the state's 100TF compute resources and 40Gbps backbone, and to take advantage of existing expertise in computational science and distributed computing. © 2007 Center for Computation & Technology. Contact the webmaster.